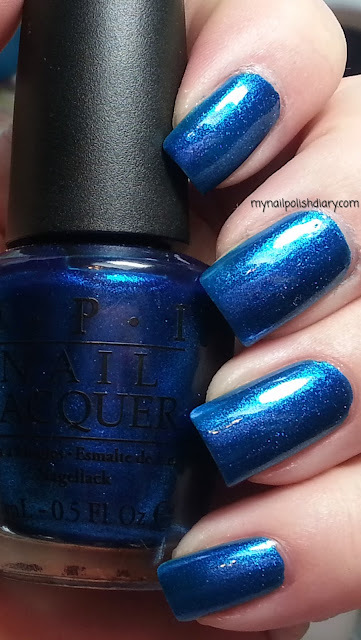 My Nail Polish Diary: OPI Swimsuit...Nailed It! OPI Swimsuit...Nailed It! is from the Miss Universe collection released summer 2011. It's blue, which isn't a normal shade I wear because most times blue makes my skin very red looking. For some reason this blue doesn't. Yay! Cause I love blue polish! OPI Swimsuit...Nailed It! is medium blue foil. It's pretty awesome to be honest. Very striking. I haven't worn this before for fear of the lobster hands, so I am thrilled my hands look normal! Application, wear time and formula are all great. I did double up with base coat to help prevent staining. When I remove it I'll put cuticle oil or creme on my cuticles and skin around my nails as well to prevent stains. Other than the staining, I love this one!